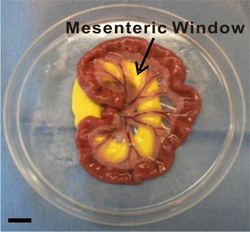 This article describes a simple model for stimulating angiogenesis in the rat mesentery. The model produces dramatic increases in capillary sprouting, vascular area and vascular density over a relatively short time course in a tissue that allows en face visualization of entire microvascular networks down to the single cell level. Yang, M., Stapor, P. C., Peirce, S. M., Betancourt, A. M., Murfee, W. L. Rat Mesentery Exteriorization: A Model for Investigating the Cellular Dynamics Involved in Angiogenesis. J. Vis. Exp. (63), e3954, doi:10.3791/3954 (2012). Microvacular network growth and remodeling are critical aspects of wound healing, inflammation, diabetic retinopathy, tumor growth and other disease conditions1, 2. Network growth is commonly attributed to angiogenesis, defined as the growth of new vessels from pre-existing vessels. The angiogenic process is also directly linked to arteriogenesis, defined as the capillary acquisition of a perivascular cell coating and vessel enlargement. Needless to say, angiogenesis is complex and involves multiple players at the cellular and molecular level3. Understanding how a microvascular network grows requires identifying the spatial and temporal dynamics along the hierarchy of a network over the time course of angiogenesis. This information is critical for the development of therapies aimed at manipulating vessel growth. 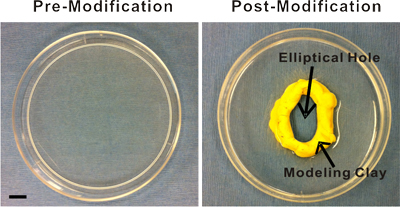 The exteriorization model described in this article represents a simple, reproducible model for stimulating angiogenesis in the rat mesentery. It was adapted from wound-healing models in the rat mesentery4-7, and is an alternative to stimulate angiogenesis in the mesentery via i.p. injections of pro-angiogenic agents8, 9. The exteriorization model is attractive because it requires minimal surgical intervention and produces dramatic, reproducible increases in capillary sprouts, vascular area and vascular density over a relatively short time course in a tissue that allows for the two-dimensional visualization of entire microvascular networks down to single cell level. The stimulated growth reflects natural angiogenic responses in a physiological environment without interference of foreign angiogenic molecules. Using immunohistochemical labeling methods, this model has been proven extremely useful in identifying novel cellular events involved in angiogenesis. Investigators can readily correlate the angiogenic metrics during the time course of remodeling with time specific dynamics, such as cellular phenotypic changes or cellular interactions4, 5, 7, 10, 11. Prior to the surgery sterilize surgical supplies and instruments. Supplies used for the sterile surgical procedure for each rat include 1 drape to be layed out as a sterile surface for the placement of instruments, one drape with a pre-cut hole about 0.5 in x 1.5 in in the center to be placed over the rat, and gauze. The pre-cut hole on the drape will align with the incision made on the rat. Instruments needed for the surgery include 1 standard pair of scissors to be used to cut suture material, two forceps and a fine needle holder for handling and gripping of the suture, and a scalpel with a blade. We have listed the common tools used by our laboratory in the Table of Specific Surgical Materials and Tools. However, final tool selection depends on experimenter preferences. Prepare the surgery space. Place a 100 mL 0.9% sterile saline bag under a heating pad to ensure that the saline that comes in contact with the mesentery tissue is pre-warmed to approximately 37 °C. As an alternative to saline, you can use Ringer's solution or another physiological buffer. Lay out sterilized surgical instruments and supplies on a sterile drape for easy access during the exteriorization procedure. Also, you will need sterile cotton tip applicators and the appropriate 3 types of sutures (4-0, 5-0, and 7-0). Makes sure packages are pre-opened so that the materials can be accessed with sterile handling. Finally, disinfect the pre-modified plastic stage by immersing it in 100% ethanol for at least 5 minutes. The stage is a 100 mm Petri dish with an elliptical hole cut in the center (Figure 1). A Dremel Tool can be used to initially make and, if necessary, widen the hole. After the hole is made, the edges of the cut plastic are made smooth using sand paper of different grains. The stage is then washed and, finally, either inert modeling clay (purchased from a local crafts store) or silicon glue is added to the hole's edge in order to provide a raised, smooth surface. Prior to contact with the tissue, the stage will need to be adequately rinsed with sterile saline. For this model of angiogenesis, we typically use adult Male Wistar rats (350 ± 25 g). Other rat strains and ages can be used. In our laboratory, rats are anesthetized via intramuscular injection with ketamine (80 mg/kg b.w. ), xylazine (8 mg/kg b.w. ), and atropine (0.08 mg/kg b.w.). After approximately 5 mins, the effect of anesthesia is confirmed and the rat's abdominal skin is shaved. Position the anesthetized rat on its back on a heating pad to maintain body temperature. Aseptic techniques are used during the surgical procedure. Wear sterile gloves and do not allow instruments and supplies to contact non-sterile surfaces other than the rat tissues. Clean abdominal area with alternating wipes using the sterile gauze soaked in 70% isopropyl and iodine. Using the scalpel blade, make a small (approximately 0.75 inch) longitudinal incision along the skin and then the linea alba approximately 1 inch below the sternum. Place the pre-cut drape over the abdominal section so that the opening aligns with the incision. Gently apply pressure around the incision. This usually will result in exposure of the small intestine enough for it to be easily identified. Using the cotton tip applicators, gently pull out a section of the small intestine and locate the ileum. As the mesentery is pulled out, it should be gently layed out in the plastic stage (Figure 2). Identify 6-8 vascularized mesenteric windows. A mesenteric window is defined as the thin translucent membrane in between the artery/vein pairs feeding the small intestine (Figure 2). Record the starting time of exteriorization. Leave the mesentery section exteriorized for 20 minutes. During the exteriorization period, use a sterile syringe (5 mL) to intermittently replenish the saline in the Petri dish to ensure that the tissue remains immersed and does not dry out. During the 20-minute exposure time, mark the 2 centrally located mesenteric windows with sterile 7-0 suture. The marks should be made in the fat area near the intestine. Return the exteriorized region of the mesentery to the abdominal cavity. Close the abdominal muscle with 5-0 monofilament suture in interrupted pattern. Close the skin with 4-0 monofilament suture in interrupted pattern. Wipe the sutured area with alternating wipes using the sterile gauze soaked in 70% isopropoyl and iodine. Spread eye lubricant gel on both eyes of the rat. The purpose of lubricating the eye is to prevent desiccation of the cornea during surgical procedure and recovery. The application of eye lubricant should be applied prior to the start of surgical intervention. If necessary, re-apply eye lubricant prior to returning the rat to its cage for recovery. On the day of interest post stimulation, anesthetize and euthanize the rat. In our laboratory, rats are anesthetized via intramuscular injection with ketamine (80 mg/kg b.w. ), xylazine (8 mg/kg b.w. ), and atropine (0.8 mg/kg b.w.) and then euthanized via intracardiac injection of beuthanasia. Beuthanasia is a pentobarbital sodium/phenytoin solution that can be used for rapid and painless euthanasia. Per rat our laboratory typically injects 0.1 - 0.2 ml. Re-open the abdominal cavity and gently remove the small intestine and locate the two-marked windows. Cut out each of the exteriorized mesenteric windows using forceps and micro-scissors. Including a border of fat per window is advantageous for later tissue spreading onto microscope slides. Immediately, immerse each window in PBS. When cutting, try to avoid cutting through artery/vein pairs within the fat border of the windows to minimize potential blood filling of the windows. Also, minimize cutting through the bowel that results in intestinal content contacting the windows. Use forceps to spread tissues on positively charged microscope slides. Two tissues can be mounted per slide. Allow the tissues to partially dry and using a scalpel blade remove the excess fat. Tissues are now ready to be fixed. Typical fixation methods can be used. In our laboratory, we commonly fix the slides in methanol (-20 °C) for 30 min. Successful labeling has also been performed with unfixed tissues. Fixation methods might depend on your preferred antibody. Tissues can generally now be labeled according to instructions per antibody for immunohistochemistry. Given our interest in identifying the roles of vascular pericytes during angiogenesis, our laboratory commonly labels for endothelial and perivascular cells10, 12, 13. Useful labels to identify endothelial cells along the hierarchy of the microvascular networks are an anti-PECAM antibody or BSI-lectin. Perivascular cell markers used in this tissue include NG2, desmin, SM-α actin, PDFGRβ, and class III β-tubulin. Below, in section 3.3, we have listed protocols for colorimetric and fluorescent PECAM immunolabeling protocols. Prior to the initial primary antibody incubation, slides are vacuum dried to remove excess buffer solution. Also, tissues are initially outlined with a wax pen to prevent uncontrolled flow of antibody solutions away from the tissue. Finally, all labeling steps are followed by washing steps. For washing steps, slides are placed inside staining jars. The buffer solution is exchanged 3 times during the wash duration. Primary antibody incubation: Drip approximately 100-200 mL primary antibody solution (1:200 mouse monoclonal biotinylated CD31 antibody diluted in antibody buffer (0.1% Saponin in PBS + 2% BSA)) on top to each tissue; make sure the whole tissue is covered with antibody solution. Incubation for 1 hour at room temperature. Wash tissues with PBS +0.1% saponin for 30 minutes. Secondary antibody incubation: Drip secondary antibody solution (VECTASTAIN Elite ABC solution from Vector Laboratories; a streptavidin peroxidase secondary antibody solution) on top of tissues. Incubate at room temperature for 1 hour. Incubate tissues with Vector Nova Red for 15 minutes. Then rise tissues with water. Mount slides: Dip slides in 95% ethanol 10 times. Immerse slides in 100% ethanol for 2 mins. Immerse slides in another 100% ethanol solution for 2 mins. Then immerse slides in consecutive 100% xylene solutions for 2 minutes each. Allow to dry and cover tissues with a thin layer of VectaMount and a coverslip. Secondary antibody incubation: Drip secondary antibody solution ((1:100 Streptavidin-CY3 diluted in antibody buffer (0.1% Saponin in PBS + 2% BSA)) on top of tissues. Incubate at room temperature for 1 hour. Mount slides: Drip 50:50 PBS with glycerol on top of tissues. Cover with cover slip. Then, use nail polish to seal the gap between cover slip and slide. Representative images of rat mesentery tissues immunohistochemically labeled for PECAM are displayed in Figure 3. PECAM labeling identifies all vessel types along the hierarchy of remodeling microvascular networks and can be used to quantify angiogenic metrics at specific time points post stimulation. PECAM labeling also allows for the determination of arterioles versus venules. Feeding arterioles typically exhibit smaller diameters and elongated endothelial cell morphology compared to paired venules (Figure 4). Capillaries and capillary sprouts can be identified based on their vessel diameter and relative position within a network. Typical characteristics of remodeling networks include increased capillary sprouting, vessel density, vascularized area and venular tortuosity. Quantification of various angiogenic metrics identifies the time course of network growth (Figure 5). Capillary sprouting from pre-existing vessels, peaks between Day 3 and Day 5 and returns to the unstimulated level by Day 10. This transient increase in sprouting is followed by increases in vascular density and vascularized area. As evidence for the remodeling of larger vessels in this model, the number of arteriole and venule segments also increases over the time course. In our laboratory, this model has been used to identify cellular phenotypic changes at specific time point during this remodeling process10, 11. For example, class III β-tubulin identifies pericytes along angiogenic vessels (Figure 6). In unstimulated tissues, class III β-tubulin expression is nerve specific. In contrast, during the peak of capillary sprouting, class III β-tubulin is expressed by perivascular cells. This type of result highlights the use of this simple and robust angiogenic model to identify novel cell types involved in the angiogenic process. Figure 1. Images of the plastic stage pre- and post-modification. The pre-modified stage is a 100 mm Petri dish. Modifications include an elliptical hole cut in the center and the subsequent addition of modeling clay or silicon glue to the hole's edge for the creation of a raised, smooth surface. This surface provides an inner boundary that facilitates superfusion of the exteriorized mesenteric windows. Scale bar is 1 cm. Figure 2. Image of exteriorized mesenteric region. Mesenteric windows are defined as the thin translucent membranes between the artery/vein pairs feeding the small intestine. During the exteriorization duration, the mesenteric region is laid out and immersed in saline inside a modified Petri dish. Inert yellow modeling clay provides a smooth surface for the mesentery to be pulled through the pre-cut hole. Scale bar is 1 cm. Figure 3. Representative images of mesenteric microvascular networks from unstimulated tissues and tissues at 3 and 10 days post exteriorization of the mesentery. PECAM labeling identified the hierarchy of microvascular networks including, arterioles (A), venules (V) and capillaries (C). Post stimulation, microvascular networks displayed an increase in capillary sprouting (arrow heads) and vessel density. Scale bar is 100 μm. Figure 4. Representative images of arteriole/venule pairs within adult rat mesenteric microvascular networks. In both images, arterioles (A) can be differentiated from venules (V) based on a smaller relative diameter and elongated endothelial cell morphology. Scale bars are 20 μm. Figure 5. Representative quantification of angiogenic metrics over the time course of microvascular growth post mesentery exteriorization. A) Vascular area per tissue area. B) Number of capillary sprouts per vascular area. C) Total vascular length per vascular area. *represents significant difference compared to unstimulated group. Statistical comparisons were made using a One-Way ANOVA followed by Dunn's test. (p < 0.05). UN represents unstimulated. Figure 6. Representative fluorescent images of mesenteric microvascular networks from unstimulated tissues and tissues at 3 and 10 days post exteriorization of the mesentery. Immunofluorescent PECAM labeling (red) identifies endothelial cells, and class III β-tubulin labeling (green) identifies nerves (arrow heads) and perivascular cells (arrows). Perivascular cells transiently upregulate class III β-tubulin during capillary sprouting. In unstimulated microvascular networks, class III β-tubulin is nerve specific and does not identify perivascular cells. 3 days post stimulation, class III β-tubulin positively labels perivascular cells along microvessels. By day 10, class III β-tubulin expression pattern begins to return to the unstimulated scenario. Scale bar is 50 μm. Figure 7. Images supporting the feasibility of tracking pre-labeled locally applied cells during microvascular network growth stimulated by the mesentery exteriorization. Cells were superfused over mesenteric windows during the 20-minute exteriorization period. 1 day post-surgery, DiI labeled cells (red) were observed in the dame focal plane with PECAM positive microvessels (green). A, B) Examples of DiI labeled bone marrow cells exhibiting rounded and elongated morphologies. In some cases (arrows) cells were elongated along microvessels. C) Example of a cluster of DiI labeled mesenchymal stem cells near the tip of a capillary sprout (arrow). Scale bars are 50 μm (A), and 20 μm (B, C). The exteriorization model was reported in 2006 and is adapted from previous mechanical injury rat mesentery models of angiogenesis4-7 and produces similar results to well established i.p. injection models that take advantage of the rat mesentery9. The 20 minute exteriorization time was experimentally determined to produce a robust angiogenic response. While this time period could be varied, it does allow for local application of angiogenic inhibitors4 for mechanistic studies and direct application of exogenous cells for cell lineage studies. Feasibility of cell incorporation into remodeling mesenteric tissue is supported by preliminary studies in our laboratory using pre-labeled bone marrow cells and mesenchymal stem cells (Figure 7), and by the success of investigating the fate of human adipose-derived stromal cells injection i.p.14. In our laboratory, we have used this model to identify pericyte phenotypic changes over the time course of the angiogenic response10 and to assess the angiogenic potential during pathological conditions, such as hypertension12. The angiogenic response and cell phenotype changes associated with this model can also be observed in other rat mesenteric angiogenic models including chronic hypoxia exposure10, 11. A limitation of the exteriorization model is that the exact triggering mechanisms of angiogenesis are unknown. Exteriorization of the mesentery has been linked to mast cell degranulation and increased histamine levels6, yet further investigation is required to gain more insight. The angiogenic stimulus is undoubtedly multi-factorial, producing a robust remodeling response across the hierarchy of a microvascular network. While the unknown mechanisms remain a major critique of this model, its reproducibility and simplicity make it attractive for identifying cellular dynamics involved in the inherently complex capillary sprouting process. The reproducibility of the model is supported by comparable angiogenic metrics over the time course of microvascular network growth across multiple rat strains (male Wistar and female Sprague-Dawley) in previously published studies from our laboratory10, 12. Since, the majority of adult rat mesenteric tissues are vascularized, the model also allows for multiple tissues to be examined per animal. Unfortunately, this model is not obviously applicable to genetic mouse models as mouse mesenteric windows have less native vascularization and, in our experience, commonly lack observable branching networks. Future applications include the investigation of vessel functionality during angiogenesis using intra-vital microscopy at specific time points and the investigation of related cellular dynamics involved in lymphangiogenesis and neurogenesis. Though the extent of native vascularization per mesenteric window seems to be roughly proportional with age, we have observed branching microvascular networks in male Wistar rats as young as 4-5 weeks old. These observations suggest that the exteriorization model could also be applied to compare the angiogenic differences across ages. We have nothing to disclose. This work was supported by the Board of Regents of the State of Louisiana LEQSF(2009-12)-RD-A-19 (PI: W.L. Murfee) and the Tulane Hypertension and Renal Center of Excellence funded by NIH grant P20RR017659-08 (PI: L. Gabriel Navar). Table of Specific Surgical Materials and Tools. Carmeliet, P., Jain, R. K. Angiogenesis in cancer and other diseases. Nature. 407, 249-257 (2000). le Noble, F. A., Stassen, F. R., Hacking, W. J., Struijker Boudier, H. A. Angiogenesis and hypertension. J. Hypertens. 16, 1563-1572 (1998). Peirce, S. M., Skalak, T. C. Microvascular remodeling: a complex continuum spanning angiogenesis to arteriogenesis. Microcirculation. 10, 99-111 (2003). Anderson, C. R., Ponce, A. M., Price, R. J. Immunohistochemical identification of an extracellular matrix scaffold that microguides capillary sprouting in vivo. J. Histochem. Cytochem. 52, 1063-1072 (2004). 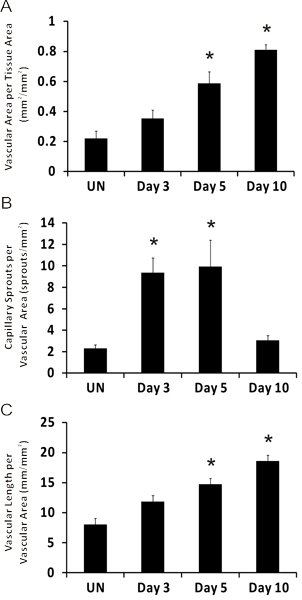 Ponce, A. M., Price, R. J. Angiogenic stimulus determines the positioning of pericytes within capillary sprouts in vivo. Microvasc. Res. 65, 45-48 (2003). Franzen, L., Ghassemifar, R., Malcherek, P. Experimental mast cell activation improves connective tissue repair in the perforated rat mesentery. Agents Actions. 33, 371-377 (1991). Anderson, C. R., Hastings, N. E., Blackman, B. R., Price, R. J. Capillary sprout endothelial cells exhibit a CD36 low phenotype: regulation by shear stress and vascular endothelial growth factor-induced mechanism for attenuating anti-proliferative thrombospondin-1 signaling. Am. J. Pathol. 173, 1220-1228 (2008). Norrby, K. In vivo models of angiogenesis. J. Cell. Mol. Med. 10, 588-612 (2006). Norrby, K. C. Rat Mesentery Angiogenesis Assay. J. Vis. Exp. (52), e3078 (2011). Murfee, W. L., Rehorn, M. R., Peirce, S. M., Skalak, T. C. Perivascular cells along venules upregulate NG2 expression during microvascular remodeling. Microcirculation. 13, 261-273 (2006). Stapor, C. P., Murfee, L. W. Identification of class III β-tubulin as a marker of angiogenic perivascular cells. Microvascular Research. Forthcoming (2011). Yang, M., Aragon, M., Murfee, W. L. Angiogenesis in Mesenteric Microvascular Networks from Spontaneously Hypertensive Versus Normotensive Rats. Microcirculation. (2011). Robichaux, J. L. Lymphatic/Blood endothelial cell connections at the capillary level in adult rat mesentery. Anat. Rec. (Hoboken). 293, 1629-1638 (2010). Amos, P. J. IFATS collection: The role of human adipose-derived stromal cells in inflammatory microvascular remodeling and evidence of a perivascular phenotype. Stem Cells. 26, 2682-2690 (2008).